Should Commercial Bus Carriers Be Subject to More Oversight In Light of Recent Accidents in California and Elsewhere? February, 2013: Bus Crash in Yucaipa, CA: On Super Bowl weekend, this past year, a commercial tour bus from Interbus Tours and Charters was coming down from Big Bear Lake in San Bernardino County, California when it lost control and crashed killing 8 people (including seven passengers and a pick up truck driver hit by the bus) and injuring 33 more (including 11 who sustained serious, life-threatening bodily harm). A California Highway Patrol accident investigation revealed a major brake malfunction due to mechanical failures including cracked drums and liners on all six brakes despite the fact that the bus had supposedly been inspected and certified as safe just a month earlier. It was revealed that federal inspectors had not even requested to inspect the various buses at the company’s San Diego, CA headquarters despite prior citations based upon spot roadside checks. December, 2012: Pendleton, OR: A commercial bus driver lost control on a slippery highway and broke through a barrier and slid down an embankment. Nine people died and the driver and 37 of the passengers were seriously injured. The primary cause of the incident was the excessive speed of the driver for the roadway conditions. An inspection and investigation revealed that the driver had been on duty for 92 hours in eight straight days of work prior to the accident and the transmission retarder that was supposed to limit the bus’s speed was not functioning at the time of the crash. Federal inspectors had previously cited the tour bus company for failing to test drivers for drug and alcohol use and other problems but, had reinstated their license in 2011 despite “longstanding and systemic” problems. Incidents like these have raised red flags with the riding public and various federal officials. The Federal Motor Carrier Safety Administration has responded by saying that the number of charter tour bus companies it has deemed unsafe and taken off the road has tripled in the past few years. The question still remains as to if the agency is adequately staffed and equipped to conduct full and thorough inspections and certifications or decertifications as it presently exists. What can California consumers do to try to make sure they are not the victim of a commercial bus crash? It is estimated that tour and intercity buses carry about 700 passengers in the U.S. every year. Many of these travel for events related to church, school or other community activities. This is second only to commercial airlines in the number of passengers serviced. While most intercity buses in California are controlled and regulated by various government agencies like METRO, BART and SDMTS, commercial tour buses are usually operated by private entities. The best thing to do prior to taking a trip on one of these lines is to do some homework. The internet is a great resource to find out if the bus line in question has a bad track record for maintenance, accidents, and driver errors. The Federal Motor Carrier Safety Administration has a website dedicated to providing consumers information about commercial bus travel (See Link: http://www.fmcsa.dot.gov/safety-security/pcs/Index.aspx). You can also just conduct a general news search about incidents involving the particular charter company. What Can You Do If You Are The Victim of A Charter Bus Accident in California? The best thing to do if you or a loved one are a passenger on a commercial charter bus in California that crashes and causes persons to be injured or killed is to consult with an experienced personal injury attorney familiar with investigating and prosecuting claims related to bus accidents. There are many potential complications that make the prosecution of these claims difficult without competent legal counsel. If the incident occurs on a bus line being run by a government agency, you may have as little as 6 months to file a government tort claim and limited time thereafter to file a lawsuit depending upon whether the claims is accepted, rejected or ignored. 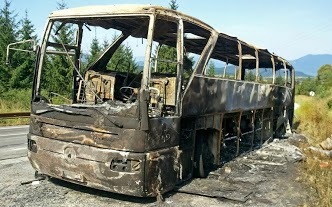 If you are dealing with a private bus company, there is much leg work that needs to be done to investigate the prior accident and claims history of the company and any involved driver and to determine the factual cause of the accident and then analyze whether the facts constitute negligence (or even willful or wanton misconduct) under California law. Associated Press, November 7, 2013: “Government Oversight of Bus, Truck Industries Faulted”.